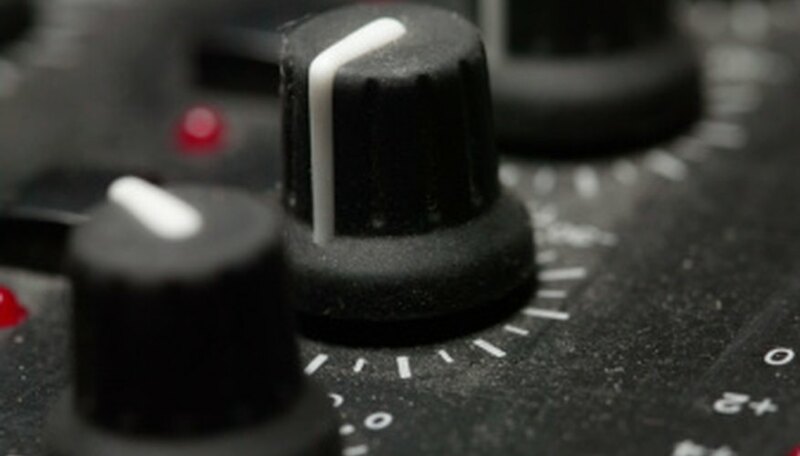 The ability to record music to home computers and laptops has become commonplace, and a small mixer is an ideal addition to a budding home studio. Behringer has been offering a wide range of audio gear and the Xenyx 802 mixer is a versatile option that offers useful features in a small package -- at home, onstage and in the studio. A replacement for the popular MX602A, the Xenyx 802 does not mess with success. Prepare the Xenyx 802 by "normaling" the board through adjusting all the controls. If there is a center detent, leave the control knob in that position. Otherwise, rotate the knob fully counterclockwise. Connect the "MAIN OUT" jacks to your recording system or to amps of a PA system using 1/4-inch phone-plug cables. Connect headphones, if you are using them, to the "PHONES" jack. Connect the input section. Microphones, if used, are plugged into channels one and two when using XLR cables, or any channel if using 1/4-inch phone plugs. Instruments are connected to any channel using the 1/4-inch jacks. Assume a microphone connected on channel one for illustrative purposes. Adjust the "GAIN" of channel one to the 12-o'clock position. Turn the "LEVEL" control slowly clockwise, while speaking into the microphone, until you either hear sound or see it represented in your recording software. Set the "LEVEL" control to a comfortable volume without distortion. If the signal is not loud enough, increase the "GAIN" setting. Optionally, adjust the sound of the microphone using the "EQ" settings. Connect an effects unit, if desired, by using 1/4-inch patch cables from "AUX SEND" on the Xenyx 802 to the input of the effects unit, and from the output of the effects to the "AUX RETURN," either stereo or mono, depending on the effect. Add the effect to the microphone signal by rotating the "AUX" control on channel one clockwise. Connect and adjust additional microphones or instruments. Additionally, a CD player can be connected via the "CD/TAPE" input jacks. Recording equipment can alternately be connected via the "CD/TAPE" output jacks. The "AUX RETURN" jacks can be used as additional inputs if an effects unit is not used. The "AUX RET" control will adjust level.